Tomorrow Mr. Larios will be speaking in remembrance of his son Dani Larios. 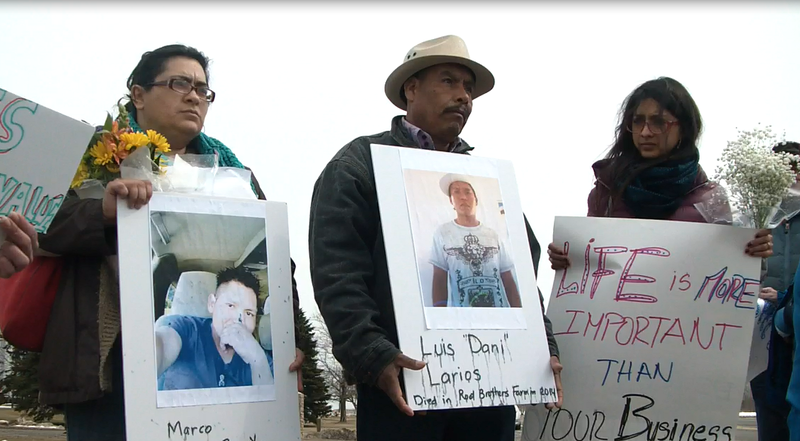 Dani passed away during a fatal on the job incident last August of 2014 while working under Roots Bros. Dani Larios had been a farm worker in the United States for several years. In Mexico, his country of origin, he used to be a technical engineer. He leaves behind his family, wife and daughter of four years old. After months of his passing, his father came to upstate New York seeking justice for him and to motivate workers to keep fighting for their rights to have a safe and healthy work environment. On Friday, March 20 we had the honor of accompanying Mr. Larios in a vigil (in Albion, NY) to commemorate his son Dani, and the lost lives of other farm workers such as Francisco and Marco. Too many farmworkers continue to lose their lives while at work. According to the New York State Department of Health, 61 farmworkers have been killed in New York State farms from 2006-2014. In 2014 alone, 23 workers were killed, the number one cause of death are a result of tractor rollovers and/or entanglement in other farm machinery. Mr. Larios will speak tomorrow at 6pm in the Plymouth Church of Syracuse, NY. The address is 232 E. Onondaga St. Syracuse, NY 13202.We hope you join us tomorrow evening to support Mr. Larios and remember the life of his beloved son Dani Larios. Rebecca Fuentes (WCCNY) and Paola (Workers Justice Center) stood beside Mr. Daniel Larios during a press conference in Albion, NY last Friday where he spoke about the life of his son and all of his accomplishments. Compañeros Omer and Rebecca from WCCNY and Carly Fox from Workers Justice Center stood beside Mr. Daniel Larios during a press conference last Friday in Albion, NY. We commemorated fallen workers and spoke on behalf of those who have lost their lives due to preventable on the job incidents.